The Royals host third-placed Hamworthy United at the Blanchard Wells Stadium tomorrow looking to make up ground on the pace setters (3pm). Catlin is hoping to help the hosts produce a strong second half of the season. The former Gosport Borough boss said: ‘If we are going to get ourselves up there then we must beat teams like Hamworthy, who are near the top. ‘We must aim to put a good run together and see where it propels us. ‘The next four or five games will give a good indication of where we are heading. ‘I am at the club for the long-term and the aim is to get promoted. ‘If it doesn’t happen this season then we will give it a real go next year. Saunders and Catlin are boosted by the news that Joe Noakes has decided to stay with the club. The midfielder turned down a seven-day approach from Gosport Borough. Meanwhile, Baffins Milton Rovers are aiming to get revenge on visitors Shaftesbury at the Kendall Stadium. The Dorset outfit inflicted a heavy defeat on Baffins in the reverse fixture earlier this season. ‘Shaftesbury are a bit of a bogey side for us and we owe them big time,’ said manager Louis Bell. ‘We had a player sent off at their place, so it is important we keep our discipline. Ashton Leigh returns after suspension for the Kendall Stadium club, but there are fitness doubts over Shane Cornish and Freeman Williams. 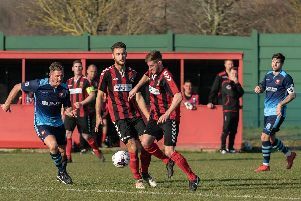 Michael Birmingham is demanding a huge reaction from Horndean as they host basement-side Petersfield Town at Five Heads Park. The Deans boss was disgusted with the performance in their 5-0 thumping at Bashley last weekend. Birmingham said: ‘That was a display I won’t put my name anywhere near. Fareham Town look to extend their good league form as they host struggling Amesbury Town.